A warm welcome to my blog "Cookies, Craft & Co" in Germany. So many talented and wonderful, creative people followed Kelly's blog hop invitation. She is celebrating 5 years as a Stampin' Up! demonstrator. And you can't imagine how blessed I am to be part as a friend of this blog hop. Thank you Kelly and Happy Birthday! Such a great birthday party needs a special project around the theme "Happy". In case of a birthday it suggest itself to create a birthday card. I used three different green ink colors and mixed them on the clear bock with the aqua painter. The next step is to squirt water on the clear block. Quite simple with the spritzer. 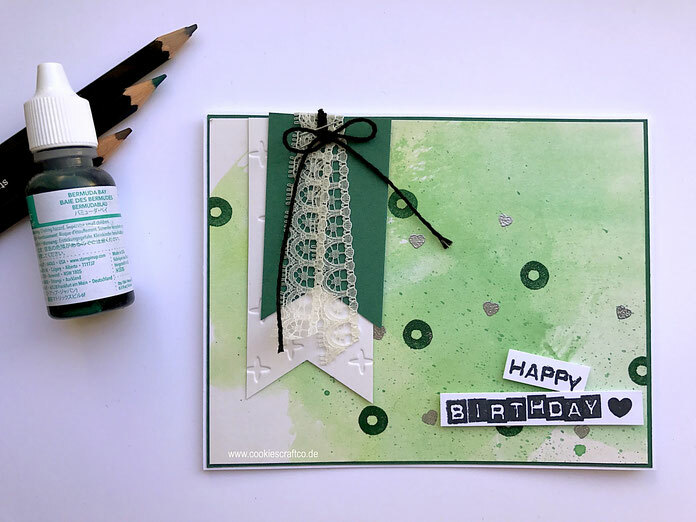 Now you move the clear block on the paper and you finished your amazing background :) With a few small stamps and a little bit of ribbon you create this card. I hope you love my card and thank you for visiting my blog and my project. Have fun and enjoy all of the awesome projects. The group is amazing and we all are happy about your comments.